Last updated on January 15, 2014 May 14, 2018 by Daniel Waldron for Armagard Ltd.
Armagard’s custom, 60” PDS LCD enclosures make fine focal feature for new Stonehenge visitor centre. Armagard custom-made 60″ PDS LCD enclosures, Stonehenge. Three custom-made Armagard 60” PDS enclosures provide the interior focal point for Stonehenge’s new £27 million state-of-the-art visitor centre. The sleek, aesthetically designed LCD enclosures were unveiled as part of the grand opening of the new visitor centre facility at the historic site, which opened its doors to the public on 18 December 2013, 24 years after the parliamentary public accounts committee called for a facility ‘suited to the requirements of Stonehenge’. The custom LCD enclosures also feature a custom-colour finish (dusty grey), which lends itself well to the look and feel of the pristine facility, blending in with the surroundings yet providing a striking and attractive focal point, with which Stonehenge tourists can engage and interact. Armagard was tasked with the project of producing the three custom LCD enclosures due to the company’s experience of providing bespoke enclosures and reputation for delivering expertly engineered protective enclosure units. Armagard Limited manufactures PC enclosures, printer enclosures and digital signage enclosures and supplies them to customers all over the world. Armagard enclosures are used by some of the biggest brand names including Tesco, Cadbury and Ford and have been installed at a number of high-profile locations such as the London 2012 Olympics, the Euro 2012 football championships and ‘The Ashes’ Cricket Tour. The Stonehenge visitor centre becomes the latest high profile location to utilise Armagard custom LCD enclosures, after identifying the units as the ideal solution for protecting the screens installed at the new facility. 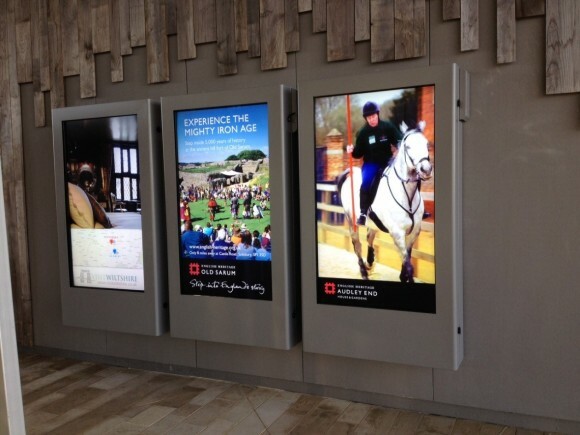 The custom LCD enclosures are currently accommodating 60” screens and will be used to display tourist information, details of events and promote the county of Wiltshire. Given the volume of tourists that visit the Neolithic site on a yearly basis, it’s expected that the newly installed screens will experience extensive use. The purpose of the LCD enclosures is to provide complete protection against physical impact and penetration from environmental elements such as water and dust. The custom LCD enclosures provide a modern, contemporary look that is in keeping with the interior of the new facility making them an eye-catching centrepiece for the Stonehenge site’s new futuristic building. This entry is filed under digital signage, digital signage enclosure, lcd enclosure, Uncategorized. You can follow any responses to this entry through the RSS 2.0 feed. Both comments and pings are currently closed.